Community Folk Art Center (CFAC) is collaborating with Students Rebuild, Syracuse University Arts Engage and the Congolese community of Syracuse to host a One Million Bones workshop, a social arts initiative that brings awareness to genocide by educating and engaging communities. On Wednesday, Oct. 17, Students Rebuild will lead a workshop for students at 3 p.m. and again at 6:30 p.m. for community members. CFAC is the first stop on Students Rebuild’s countrywide tour. The two-part workshop features a multimedia presentation on genocide and a bone-making activity. The bone-making process is meant to remind individuals of the human cost of genocide, thereby provoking dialogue on the global issue. Participants will learn how to create bones out of clay, newspaper/masking tape and plaster gauze. CFAC is challenging the Syracuse community to create at least 1,000 bones during the 30-day period following the workshop. Individuals and groups are encouraged to call CFAC at 315-442-2230 or email cfac@syr.edu to schedule a time to create bones. If CFAC reaches its goal, Students Rebuild will fly a representative from the organization to Washington, D.C., to participate in its “Road to Washington” visual petition in April 2013. “As an arts organization we don’t get many opportunities to use creative projects to engage with the community in such a direct way, particularly around issues of social justice. 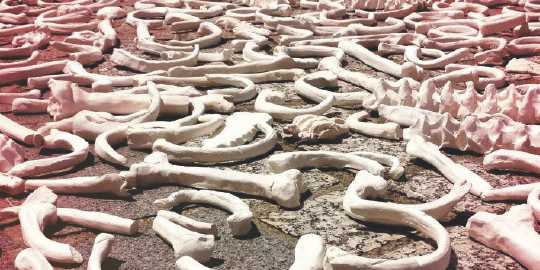 The One Million Bones Project is a wonderful opportunity to do this,” CFAC Executive Director Kheli Willetts says. For every bone created, the Bezos Family Foundation will donate one dollar to CARE, a leading relief and development non-governmental organization fighting global poverty. The foundation will donate up to $500,000. “By giving people the power to create something physical, they become intimately connected with global social problems that can otherwise seem amorphous. This project is a perfect tangible manifestation of art’s potential to involve local, national and global communities simultaneously. It is an important next step toward creating and maintaining awareness of these issues in our community, especially in light of ‘Cry for Peace: Voices from the Congo’ Syracuse University Performing Arts Presenter Carole Brzozowski says. Students Rebuild is hosting 35 workshops in the Northeast and 150 workshops throughout the country. At the end of its tour, Students Rebuild will use the bones collected at the workshops to create a monumental installation of one million bones on the National Mall in Washington, D.C., on April 28, 2013.